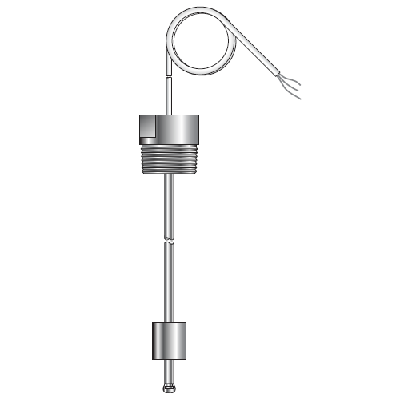 The LFT42 are synthetic (non-metallic wetted parts ) float level transducers suitable for level measurement in vessels of up to 96 inches in height. Floats are made from PTFE. Tubes are 316SS clad with PFA or PTFE. Flanges and fittings are available in Polyethylene (PE), Polypropylene (PP),PVC and PTFE. The use of 2″ NPT fitting or flange accommodates the diameter of the float and allows the units to be installed from the top of the vessel or mounting bracket, without removing the float. Each transducer comes standard with a remote mounted DIN rail transmitter, float and a fitting/probe. Reliable operation and simple design makes the LFT42 an excellent choice for many corrosive level sensing applications.